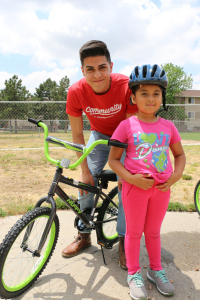 More than 80 kids who call Mercy Housing home now have bikes, thanks to the efforts of two Denver-based organizations! 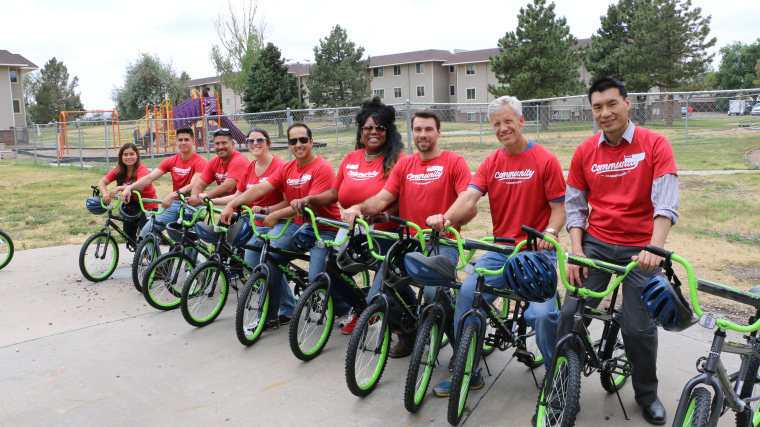 On Friday, June 30, Janus Henderson Investors, a leading global active asset manager, and Wish for Wheels, a nonprofit that gives bikes to kids from low-income families, teamed up to build 80 bikes and deliver them to the ecstatic children living at Holly Park, a Mercy Housing community in Commerce City, Colorado. The 44 employees of Janus Henderson Investors met in the morning to do a “team build” with Wish for Wheels. After the bikes were built, the two organizations delivered them to Holly Park. As dozens of kids came pouring in to claim their bikes, Wish for Wheels and Janus Henderson Group employees distributed helmets, adjusted the bikes’ seat heights, and made sure that kids knew how to ride safely. “The event was awesome,” said Demesha Hill, Community Relations Manager with Janus Henderson Investors. “It was a great way for us to give back to our community and really make an impact in young people’s lives by giving them their first bike. The bikes will encourage the kids at Holly Park to spend time outside and exercise. As the Centers for Disease Control and Prevention (CDC) notes, children and teenagers who exercise regularly are less likely to develop heart disease, cancer, type 2 diabetes, high blood pressure, and a host of other health conditions. A big thanks to the Janus Henderson Investors, Wish for Wheels, and the amazing staff at Holly Park for bringing bikes to these enthusiastic riders! Janus Henderson Investors exists to help clients achieve their long-term financial goals. Formed in 2017 from the merger between Janus Capital Group and Henderson Global Investors, they are committed to adding value through active management. For them, active is more than their investment approach – it is the way they translate ideas into action, how they communicate their views, and the partnerships they build in order to create the best outcomes for clients. For more information about Janus Henderson Investors, please visit their website at janushenderson.com.